The card edge connectors is a series of metal tracks ending on the surface of a card, at the edge and it is plugged into edge connector which primarily helps in data transmission. Growing technological user base across the world is expected to remain key growth driver for card edge connectors during the period of study. This report identifies the card edge connectors market size in for the year 2015-2017, and forecast of the same for year 2022. 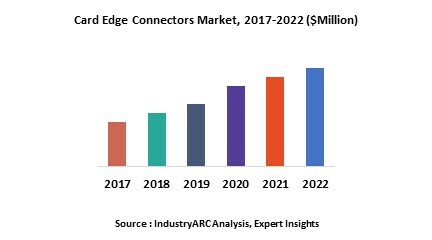 It also highlights the potential growth opportunities in the coming years, while also reviewing the market drivers, restraints, growth indicators, challenges, market dynamics, competitive landscape, and other key aspects with respect to card edge connectors market. Geographically North America dominated card edge connectors market driven by technological advancement and usage of high end technology in the field of measurement equipment, control equipment, measurement devices and communication equipment. North America was followed by Europe and Asia-Pacific as the second and third largest market for card edge connectors in 2015. However, expanding technological user base in developing nations of Asia-Pacific is expected to result into highest growth for the region amongst all regions during the period of study.